After procrastinating and covering the shop in afine layer of dust for years, I finally decided to spend the moneyand get an air cleaner. I did my research, or tried to. There wasnot much data about air cleaners out there. Nobody seems to havetested them. I eventually bought the G9956 from Grizzly. Air cleaners are an essential component in every shop. They remove dust particles from the air that the dust collector did not catch. A good air cleaner significantly reduces the abient dust in the shop. In addition to the safety factors, air cleaners significantly reduce the amount of cleaning that has to be done in the shop and in adjacent spaces. The cleaner pulls dust towards it and away from places you do not want it. Remotes are of limited value. In most cases the collector will be on while you are in the shop. If the collector is located out of reach, a standard wall switch built into the circuit that powers the collector is the best way to turn the machine on or off. The delayed-off feature is useful to get the air cleaned when you are done for the day. A timer switch built into the circuit powering the collector achieves the same result. 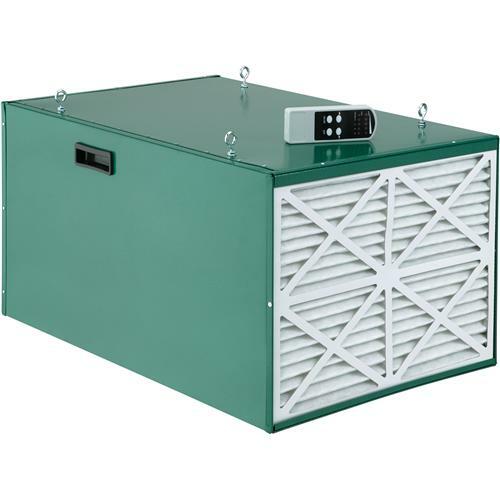 Air cleaners are metal boxes with fans and filters. The most important thing is to have one in the shop. Choose a model that can replace the air in your shop 4-5 times an hour. A model of this size should produce enough suction to attract most free dust praticles in the shop. Consider multiple units, if you shop is large or oddly shapped. High airflow joints are larger and are powered by larger motors. As a group they are louder than smaller units. Efficient collection of small particles is the main purpose of the air cleaner. Choose a model that filters the largest amount of the smallest possible particles from the volume of air pulled through the machine. "The G9956 is a bar bones air cleaner. Little more than a fan in box with filters it does only what it must. It works well and does filter the air efficiently."